Bush Pasture Park in Salem was the site for Wednesday’s Star City Classic. With a cool temperature and only a bit of drizzle it was a good day for distance runners. There were actually four varsity races with schools having the choice to enter either a 5K run or a two mile race. Sheldon runners competed in the longer event, which they dominated. They had a winning total of 25 points to defeat Marist, which had 33 points, while Sherwood was a distant third with 72 points. Sheldon’s Gracie Todd, who had won a division of the Danner Meet earlier in the season drew away by mid race to claim the victory with a time of 18:56. Her biggest challenge was in loosing time, as she tried to determine which way to run on a course, that was not always clearly marked. Her team mate Maggie Schmaedick was a story in her own right, as she placed second in the event in her first race of the season. Her return to racing after physical problems with a fine 19:04 was another bright story for Sheldon this day. Marist’s Emily Hollander broke up the Sheldon pack with her third place effort of 19:33 but Sheldon runners Kelsi Klotter (19:37) & Meredith Bothman, who followed two seconds later, pretty much locked up a Sheldon victory. Marist runners made the race quite interesting, when they swept the next four places. Monica Anderson led the way with her mark of 19:50, which was good for sixth place. She was followed across the line by Molly Bohrer (20:15), Anne Yates (20:36) and Claire Koester (20:42). Devon Greene of Sherwood placed tenth with 20:44 and Shannon Walsh earned eleventh with 20:49. Ryan Byrd of St. Helens, who had placed second at the Chapman Invitational, ran his fastest time of the year, as he earned the victory in the boys’ race. Sheldon’s Jackson Darland led early in the race but by mid-race Byrd had moved into the lead and then over the course of the rest of the event pulled away from all challengers. His final time of 16:00 gave him a margin of victory of 46 seconds. Jackson Darland actually fell back into third place during the race but roared back down the stretch to reclaim second over Nicholas Cooper of Pleasant Hills, who was also credited with 16:46. Cooper had put in a big surge in the final mile after being only in seventh place at the mile mark. David Clark finished fourth in 16:48 and was followed by Ben Hartel of Sheldon, who followed him across the finish line a second later. 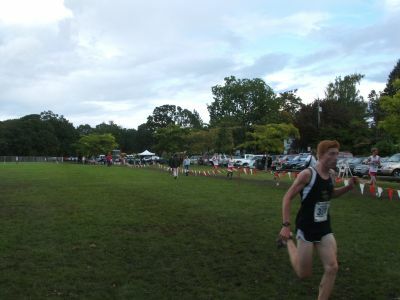 Emanuel Kraynick ran 16:57 to take sixth and the West Salem runner was the last to break seventeen minutes. Alex Lull of St. Helens placed 7th in 17:01. Matthew Thomas of West Salem earned 8th in 17:03 & Alex Johnson of Sheldon secured ninth position with his time of 17:09. Tenth and eleventh places were garnered by Will Lawrence of St. Helens & Jacob Atkinson of Sprague, who were clocked in 17:10 & 17:14 respectively. Crater runners swept the first four places in the two mile race for boys with Daniel Stober leading the way with 10:14. Jon Obeso (10:16), Neil Seibert (10:22) & Piers Rasmussen (10:27) were in hot pursuit for Crater, which already had locked up the victory. Kenny Freeman of Roseburg (10:29) & Pake Benthan of Molalla (10:29) prevented a Crater sweep by taking 4th & 5th but John Martinez of Crater earned 7th in a time of 10:40 to close out the Crater scoring. The Crater girls were not quite so dominant but they still rolled to a convincing victory, as they topped South Salem 21 to 48. 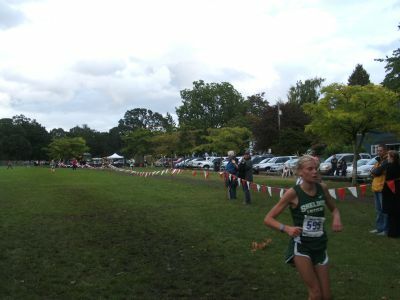 Sarah Hastings of Crater won in 11:42 and Gracie Tostenson followed with 11:43. Emily Weber of South Salem placed third with 11:59 and her Saxon team mate Vivian Hawkinson earned fourth with 12:17. Crater then took the next three places as Britney Wimberly, Jasmyn Andrews & Megan Hastings claimed fifth through seventh. Cascade’s Alexis Mitzer an 12:43 for 8th place.